I came across this site a few days ago and I had some Air drying Clay around because I like to make jewellery out of the clay. With what was left I decided I would put the clay to good use and make some figurines. 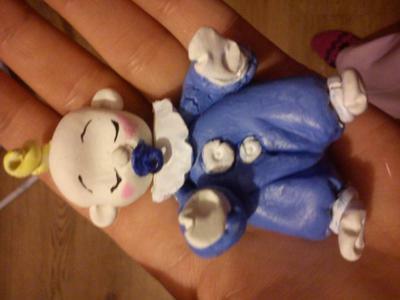 I made two figurines following instruction from your site and a sleeping baby figurine that I found on another site. I used to do art in school when I was between 15-16. I'm 32 now with 6 children. So you can imagine that I haven't really had time to start up my art work again. Until yesterday when I was feeling a little bit bored. 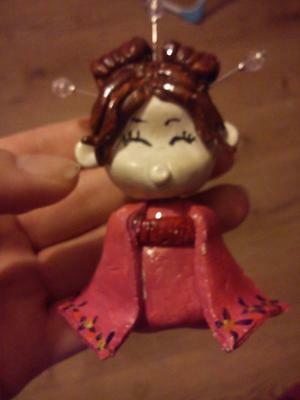 All the children were sleeping and I decided to look around online to see what I could do with the clay that I have. For the figurines I used Air dry clay which I did find to be a little bit difficult to use as it did start to dry out while I was modeling but a tiny bit of water helped with the issue. And here are the figurines I made Japanese Girl and Mini Baby girl hugging bottle as well as sleeping baby. With the Japanese girl I changed the colour of her outfit and I also used Headpins from my jewellery findings and crimp beads and three swarovski crystals for her hair accessories. Such a nice baby and Japanese girl I want 6 Japanese girls because I am arranging a party with my house and I am deciding my all relative female kids to giving this Japanese girl because it’s too cute. 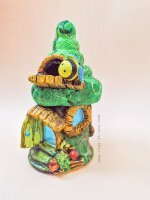 Hi Kat, thank you for sharing your air dry clay figurines and the tips to handle your clay. They look amazing! You are very talented. We are glad that you started your art work again after stopping for a long time. We are looking forward to see your other projects. Join in and write your own page! It's easy to do. How? Simply click here to return to Your Clay Model Showcase.